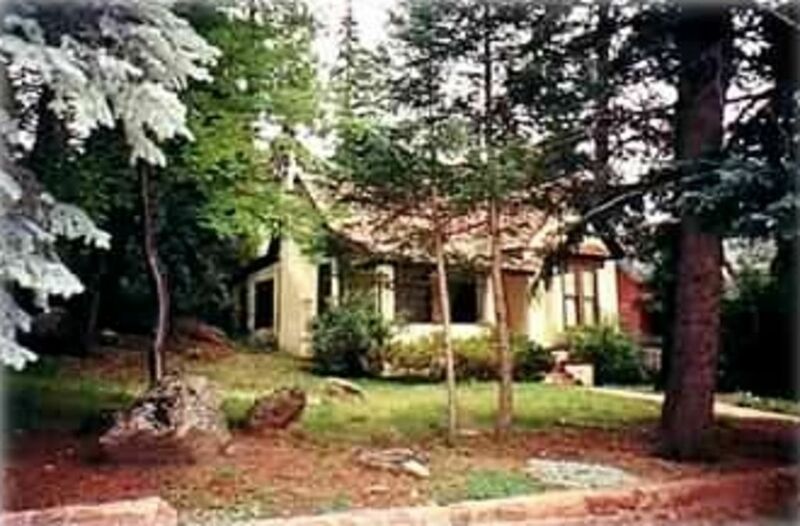 This 121-year-old cottage is nestled in the town of Cascade, close to Pikes Peak and Santa's North Pole, Cliff Dwellings, Cave of the Winds, Cheyenne Mountain Zoo. The mountain stream across the street, hiking trails, and waterfall make this an exciting getaway for vacations, anniversary, and honeymoons. The Ramona cottage has a large moss stone fireplace, Cable TV, DVD and VCR movies in the great room. The master bedroom has a king sleigh bed, the master bath has a claw foot tub, full service bath with dressing room. The sunny front bedroom has two queen beds. The dining room has a large window to view the mountains and a full kitchen with all the extras. The private hot tub out back is great to relax after a long day. Great for a romantic getaway or family vacations, girls getaway, anniversary or birthday celebrations. Bob and I came out to Colorado in 1997 and fell in love with the mountain town of Cascade. Being close to Colorado Springs and Manitou Springs, the airport and all needed shopping areas, we felt if we were going to live in Colorado we had to be in the mountains. We purchased the B & B and then the Ramona cottage. We love entertaining and gourmet cooking. This area is a great place to view the mountains and getaway from the city. Quaint mountain town just minutes from Manitou Springs, Woodland Park, Colorado Springs. Drive up Pikes Peak we are minutes from the entrance. The cottage is just a short walk to the Wines of Colorado as they offer wine tasting and great entrees for lunch or dinner,or Mildreds Cafe has great breakfasts, and homemade cinnamon rolls to die for. We are close to the drive up Pikes Peak or visiting Santa's Workshop at the North Pole. Egyptian linens on all bedding. Extra towels in all baths. on back yard of property, only used for this house, reach up and touch the stars! We had a great a relaxing time this weekend. The cottage was adorable, clean and well-kept. We loved our time there. Clean, close to activities and conveniences. Recommended! Close to 2 beautiful hiking trails and the major Colorado Springs activities. Bob and Sandy are great property owners! We have been staying in Bob And Sandy's properties since 1999. We have stayed in every property owned by their company, Cascade Escapes, numerous times and this cottage is our favorite. The linens are always fresh, everything is always clean, the kitchen is always stocked with coffee, utensils, pots and pots. Everything is always in perfect working order. Bob and Sandy are two of the most genuine, compassionate people and are always willing to do whatever guests ask of them from preparing a magnificent breakfast, to taking the guests fishing on the private lake nearby. You will never regret staying in one of their properties and I can guarantee that you will return! The beds were clean and very comfortable. It is a very quiet location except for a barking dog. The place smelled like gas and old bacon grease. Most of the windows were painted shut so we couldn't use the fresh mountain air. The sink in the second bathroom was clogged so we used the bathroom sink where the tub was. Quite inconvenient. The tub hadn't been cleaned. The trash cans were dirty. Any kitchen utensils used had to be prewashed. We have had the Ramona cottage for 12 years, no one has ever complained, we have repeat guests quite often. The windows have screens, all one has to do is unlock, they open just fine. The comments on dirty items is just not so. We live 5 minutes from the cottage, and nothing was said when we came to pick up trash. I guess this couple was mad because we were not happy that they parked their bicycles in our living room. We stayed in the Ramona in August and it was fabulous. We felt like we really "got away" even though Manitou Springs was only minutes away for anything you need. It was clean and comfortable. The hot tub was great. The hiking trail up the street was our favorite part and was beautiful. We'd love to return soon. We have been two times and will go again! Loved it! For starters, the location is awesome. The owners are two of the nicest people on earth. The house is adorable with charm. Wish the front window had curtains for night time privacy. The view is so awesome, the giant picture windows were stared out every moment we were indoors. The porch also provided a great view. The master bed is one of the most comfortable. Convenient to everything. We rode horses, hiked, went to a drive-in movie, shopped in town, dined out, went to the North Pole, river rafting, vineyards, Royal Gorge, you name it, we have done it. The only down side it the claw foot tub. Gorgeous, but not convenient. Most of us shower, so we all had to use one bathroom for that. Slowed us down a bit. I have recommended this place to lots of friends. We will definitely be back. I cannot say enough good things about the owners. Love Bob & Sandy. If you are considering this place, GO! You will love it too! Just take really good care of it. I want it to stay nice for my family. See you next year Ramona Cottage.